April News: Power Bands, Autism Awareness & More! YES! Spring is here and we're having a blast! Here at Shear Madness Haircuts for Kids, we hope you are having an absolutely amazing April too! It's hard not to smile with warmer temperatures, flowers just starting to grow, longer days and much more! And things are certainly heating up with a lot of awesome events going on this month at your local Shear Madness store! Don't miss out - read all about it in this months very cool Madtropolitan Mouthpiece! Introducing Shear Madness Super Power Bands! Because every child matters at Shear Madness, we are excited to introduce the Shear Madness Super Power Bands to help build the confidence and self-image of kids! Each band has a positive statement that will remind them just how important they are. Receive a different Super Power Band each time your child comes in and gets a haircut! Collect them all! Donations for your local Autism Organization! During the month of April, If you make an appointment between Noon and 3pm (Monday through Friday only), we'll donate $1 to our your local autism organization. Plus, if you buy a retail item, then 10% of your purchase will also be donated to your local autism support group (with coupon, which can be found on our coupon page, or in the Coupon section below). The Autism Society of America: Join Shear Madness Haircuts for Kids in recognizing the 2016 National Autism Awareness Month! According to the Autism Society, "National Autism Awareness Month represents an excellent opportunity to promote autism awareness, autism acceptance and to draw attention to the tens of thousands facing an autism diagnosis each year...Nearly a quarter century ago, the Autism Society launched a nationwide effort to promote autism awareness, inclusion and self-determination for all, and assure that each person with ASD is provided the opportunity to achieve the highest possible quality of life." After spending time working in the corporate realm, inspired professionals will sometimes find that they’re ready for a new challenge! Through the careful research of the many different options available to them, many of these career shifters are choosing franchising. If you are someone who might be interested in learning more about the many great business opportunities available with Shear Madness Franchising, then be sure to check out Franchise Opportunities to get started! April Shear Madness Fun all month long! We have a lot of fun on social media through our Free Haircut Friday contests, funny jokes, awesome customer feedback and more - and it's all happening right now on our fantastic Facebook page! Plus, if you're looking for even more Shear Madness, why not check out our madtastic updates on our Franchise Blog, Instagram, Google+, Pinterest and Twitter? Great Coupons! Chase away those winter-time blues, and throw open the windows to some sun-shiney happiness from Shear Madness! And as a bonus, this month we've got some great offers available on our coupon page! Whether it's shopping for an upcoming birthday, special occasion or just because you're in a good mood - you're sure to find that great deal you’ve been waiting for at Shear Madness Haircuts for Kids! Spring-time Crafts for Kids: Put an extra spring in your step with some fun crafts for kids (and adults too)! Check out our cool Crafts for Kids section on Pinterest, and learn how to shake things up with your own hand-made maracas, or learn how to craft an eye-catching paper hot-air balloon! Also check out how to make painted garden rocks, beautiful raindrop suncatchers, creative garden windchimes, clothespin dragonflies and spring time tree crafts (like the cute cotton ball tree pictured at left). Have fun, and have a great April! Paws 4 Autism at Shear Madness! 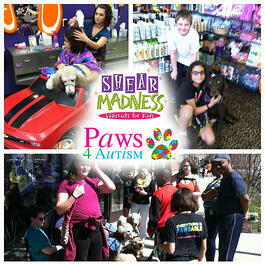 On March 15, Paws 4 Autism arrived at the Shear Madness Haircuts for Kids located in Lee's Summit, Missouri. The event, which was designed to promote Autism Awareness, was unique in that it featured service dogs trained to help autistic children. The dogs visited with families and were a big hit with kids and adults alike! Terri Wible, Executive Director and Cofounder of Paws 4 Autism, noted that there were even two standout moments that happened during the event. "The first was when we were trying to describe to the stylists and management just HOW the pups could help a child with autism during their cut. It was easier to SHOW the calming effects…so we put Merlin (one of our pups in training) up in the car while my daughter was getting her hair trimmed. Everyone was amazed at how calm he was sitting so high! The second was a lovely lady who stopped in as she was passing by just to find out about our dogs and the work Paws 4 Autism does. While she doesn’t have a direct connection to autism, she did know several who may be able to assist in fundraising or opening doors to possible sponsors. We are truly grateful for any assistance we can get!" Janon Otto, CEO of Shear Madness Franchising also attended the event, and noted how impressed she was with the dogs. "I talked to the families that attended and found that one child had meltdowns that lasted 2.5 hours - but since they received one of these service dogs, their son calms down in 5 minutes! They are also now able to take this dog with them to Wal-mart and have a leisurely shopping experience, instead of rushing to avoid a meltdown by their son." Janon also noted that, "These dogs were so calm - when they wear their vests they know that they are working and they are calm. When they don't have vests on - they behave like any other dogs!" Starting back in July of 2010, Paws 4 Austism's Mission has been to bring Autism Service Dogs and related services, including community outreach and education, service dog awareness, informational training and social skills classes, to children who demonstrate autism spectrum behaviors. Their vision is for all children on the autism spectrum and for those with spectrum behaviors to have access to specifically trained autism service and/or therapy dogs to assist with their peer interaction and improve social integration in their schools and communities. Ms. Wible also notes that, "Paws 4 Autism is 100% volunteer driven and funded by the community. Our growth is dependent upon the generosity of our Donors, Sponsors, In-Kind Partners and especially our Volunteers. If anyone is interested in finding out creative ways they can assist, including fostering puppies in training, please contact us at Paws 4 Autism!" April Fun, Autism Awareness and Special Sales! Spring is Here and we're having FUN! Hope you are having a great April! With warmer temperatures, flowers just starting to grow, daylight savings and longer days - it's safe to say that Spring is finally here! And here at Shear Madness Haircuts for Kids, things are certainly heating up with a lot of awesome events going on this month! Check it out! Donations for the Autism Society of America, and 10% off special! During the month of April, If you make an appointment between Noon and 3pm (Monday through Friday only), we'll donate $1 to our local chapter of the Autism Society of America. And don't forget that if you tell the receptionist one fact about autism, you'll get 10% off any retail item. Plus, if you buy a retail item, then 10% of your purchase will also be donated to your local chapter of the Autism Society of America (with coupon, which can be found in the Coupon section below). The Autism Society of America: The Autism Society of America's mission is to improve the lives of all affected by Autism through Advocacy, Education, Support, Services and Research. The Autism Society envisions that individuals and families living with autism are able to maximize their quality of life, are treated with the highest level of dignity, and are able to live in a society in which their talents and skills are appreciated and valued. Read more at the Autism Society of America. Did you know that our children's salon franchise system experienced triple digit growth in 2014? Are you someone who might be interested in learning more about the many great business opportunities available with Shear Madness Franchising? If so, don't miss out on our many free resources available to help pass on our extensive knowledge on franchising, running a business, and more! Click on Franchise Opportunities to get started. Great Coupons! Make the Easter Bunny proud, and fill up your Easter basket with some great goodies from Shear Madness! And as a bonus, this month we've got some great offers available on our coupon page! Whether it's shopping for Easter, an upcoming birthday, or other special occasion - you're sure to find that great deal you’ve been waiting for at Shear Madness Haircuts for Kids! Easter Crafts for Kids: Put an extra spring in your step with some fun Easter crafts! Check out our cool Crafts for Kids section on Pinterest, and learn how to make stained glass Easter egg cookies, cool centerpieces, light up fire flies made from plastic Easter eggs, Easter pudding cups, unique yarn Easter eggs, Easter hair styles - and much more! Have fun, and have a great April!